The objective of this project was to find a new use for fresh rubber coagulum as binder and live cell immobilising agent. Once prepared the culture was used repeatedly to ferment molasses containing 10% sucrose over a six-month period under non-sterile conditions. The rubber, a hydrocarbon, was completely durable, unlike carbohydrate media like alginate or karageenan. Ethanol of 90% strength was recovered from fermented liquor by single fractionation, Yield of ethanol from molasses fermentation was 47% of weight of sucrose, comparable with the best yields quoted in the literature. This work was done while the researchers (Edward Monickavasagam Harris and Ghandimathi Harihar) were in service at the Rubber Research Institute of Malaysia and first reported at the International Rubber Conference held in Kuala Lumpur in 1997. See diagram. A mixture of powdered charcoal, rubber latex and yeast were used for preparation. Dilute 100ml of latex with 200 ml water and add 200g powdered charcoal plus 30g yeast. Mix well and coagulate at ph5 using diluted 3% vinegar. The latex will set quickly. Take out coagulum and press it flat on a table using rolling pin. Cut into 1" squares and skewer with 8"-long thin stiff steel rods fixed to a wooden frame which you can house inside a suitable plastic vessel with tight-fitting vented lid to prevent loss of ethanol during fermentation. 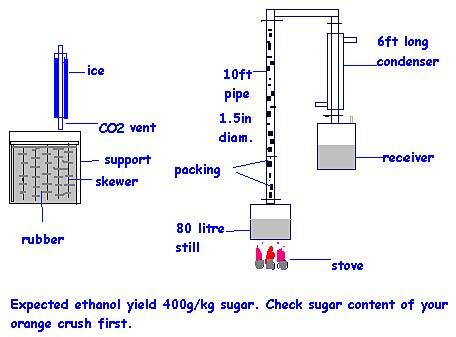 Connect the vent tube to a vertical tube, as shown, packed with ice/cold water to condense ethanol vapour during fermentation. This is essential for high yields. A 10-litre plastic container with tight-fitting lid will suffice as fermentation vessel. A 100-litre capacity cylindrical steel still with 10-ft long x 1-1/2" diameter fractionating column and condenser will suffice for separatimg the ethanol from water. The column should be packed with 1/2"-diameter x 1/2"-long thin black plastic tubes (probably polypropylene or polybutylene) for increasing contact between vapour and liquid inside the column. Make the condenser 6-ft long x 1" diameter with inlets and outlets as shown. This arrangement will easily separate 1-2 litres of spirit per hour. Ordinary wood stove using waste wood from the plantation. I used wood gas from wood pyrolysis, with recovery of many useful products: charcoal 30%, acetic acid 6%, wood spirit 1.5%, wood tar 7%, wood gas 25% (burnt under stove). The gas burns well and saves you fuel wood. Wood spirit is excellent auto fuel like ethanol. Dissolve 1kg molasses containing 50% sugar in 4 litres of water. This will give 10% sugar which is ideal. Add to the plastic container containing the immobilised yeast culture, cap and stand at 25-30 deg C (77-86 deg F). Reaction time is 2-3 days and it is over when bubbling of CO2 ceases. Carefully pour out the alcoholic solution into the still and start the next batch. Once you are familiar with the process you can scale it up 5-fold or more up to the still capacity of 80 litres. The process simplifies alcohol manufacture considerably, avoiding expensive culturing procedures. It is ideal also for ethanol manufacture from starch after conversion of the starch to sugars with enzymes, or sulphuric acid hydrolysed wood chips. There is no necessity for petroleum fuel when starch and wood are ubiquitous. In fact plantations could easily supply entire communities to meet all their fuel needs using this technology. For Malaysia alone, which has millions of acres, equivalent to 50,000 acres replanted annually per million acres, giving 5 million tonnes of biomass approximately for converion to ethanol and other products per million acres. An awful lot I would say, even if it is a guesstimate.